Saudi authorities have arrested since the beginning of the current month some 66 individuals, mostly Saudi citizens, accused of links with terrorist groups. The arrestees include 61 Saudis, one Qatari national, one Yemeni, one Sudanese and one Syrian and one Ethiopian, according to press reports. They have joined thousands of other individuals detained at the prisons of the General Investigation over terrorism related charges. The prisons of the General Investigation currently house 5,305 people including 4,448 Saudis, 3 Qataris, 24 Sudanese, 216 Syrians, 298 Yemenis and 4 Ethiopians. Some are serving their sentence, some are in the process of appealing, and others are pending investigation, the daily Arab News reports. The Saudi kingdom has seen a rise in the number of attacks lately. 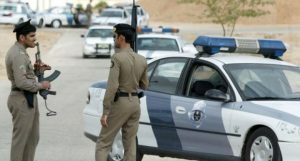 An attack on a security checkpoint in the Al-Salam Palace in Jeddah left two royal guards dead and three others wounded. The attacker was reportedly killed in the incident. Authorities have also been carrying preventive assaults on terrorist hideouts in a move to foil attacks. Written by: KanelkaTagba on October 17, 2017. Posted by KanelkaTagba on Oct 17 2017. Filed under Gulf News, Headlines. You can follow any responses to this entry through the RSS 2.0. Both comments and pings are currently closed.